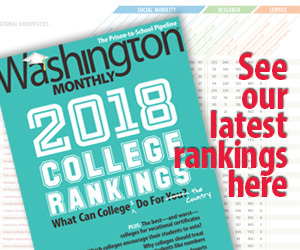 Washington Monthly | Obama’s the #1 lib? OBAMA’S THE #1 LIB?….Be prepared to hear about this, over and over again, for quite a while. If Barack Obama wins the Democratic nomination, it will be the staple of every Republican stump speech between now and Election Day. Sen. Barack Obama, D-Ill., was the most liberal senator in 2007, according to National Journal’s 27th annual vote ratings. The insurgent presidential candidate shifted further to the left last year in the run-up to the primaries, after ranking as the 16th- and 10th-most-liberal during his first two years in the Senate. If all of this sounds a little familiar, it’s because in 2004, National Journal named John Kerry the most liberal senator of 2004 (John Edwards was fourth), which became one of the principal talking points of the Bush-Cheney campaign, repeated at literally every campaign rally for months. Already, this is getting plenty of play, and for all I know, this might even help Obama in the primaries, because there are plenty of liberal Democrats out there who want some reassurance that Obama really does stand with them. But before anyone takes the National Journal rankings at face value, it’s worth noting how very flawed the methodology is. Indeed, it was misleading in 2004, and it’s equally misleading now. Taking a closer look at this year’s results, Obama and Joe Biden were both considered more liberal than Russ Feingold and Bernie Sanders. This, alone, should make one wonder about the reliability of the rankings. Better yet, National Journal’s press release on the rankings noted the criteria was based on 99 key roll-call votes last year: “Obama voted the liberal position on 65 of the 66 votes in which he participated, while Clinton voted the liberal position on 77 of 82 votes.” So, Clinton voted for the liberal position 77 times, Obama voted for it 65 times, which makes Obama the chamber’s single most liberal member. Got it. What’s more, Obama was the 16th most liberal senator in 2005, and the 10th most liberal in 2006, before racing to the front of the pack in 2007. National Journal suggests this has something to do with Obama moving to the left to curry favor with Democratic primary voters. But there’s a more logical explanation: Obama missed a whole lot of votes in 2007 — he’s been on the campaign trail — but was on the floor for many of the biggest, most consequential votes. In nearly every instance, he voted with the party. And with that, voila! The most liberal senator in America. But none of that is going to matter for the rest of the campaign. The Republican National Committee has already issued a statement and, one assumes, every far-right outlet in the country will soon do the same.